Analog Artist Digital World: Sunset "Paint In". The week long Winter Park Paint Out culminated in a Sunset "Paint In" held at the Winter Park Racquet Club, 2111 Via Tuscany, Winter Park FL 32789. The public was invited to see Paint Out Artists gathered on the shore of Lake Maitland as they captured a beautiful Florida sunset from the west-facing shores Lake Maitland. This event has become incredibly popular. I arrived right on time and had to search the entire racquet club parking lot for a spot. I believe I found the very last parking spot in the grass. And even so, two tires were on a gravel path. A line of female artists were lining the path approaching the entry to the event. I passed them and decided to get closer to the water. I settled in and started sketching from in front of a hedge. It offered some privacy since patrons couldn't stand behind me and look over my shoulder. Since I wasn't officially a "Paint In" participant, I didn't want to draw any attention to myself. Even so, I had some pleasant conversations with friends. Artwork was available for sale the night of the event and patrons could also see the evenings completed artwork in the Polasek’s “wet room” gallery the following day. There is a definite challenge to staring straight into the setting sun. I used my baseball cap to block the sun while I sketched the artists at work. I started my sketch because I liked the heroic stance of Patrick Noze as he blocked in his canvas on the far right. His broad stance suggested a confidence with his brush strokes being driven by his arms and shoulders. In contrast, Jeff Ripple was executing a small intimate painting on the left. His piece required the delicate details of tiny brush strokes. Vladislav Yeliseyev arrived later, and set up between the two artists. 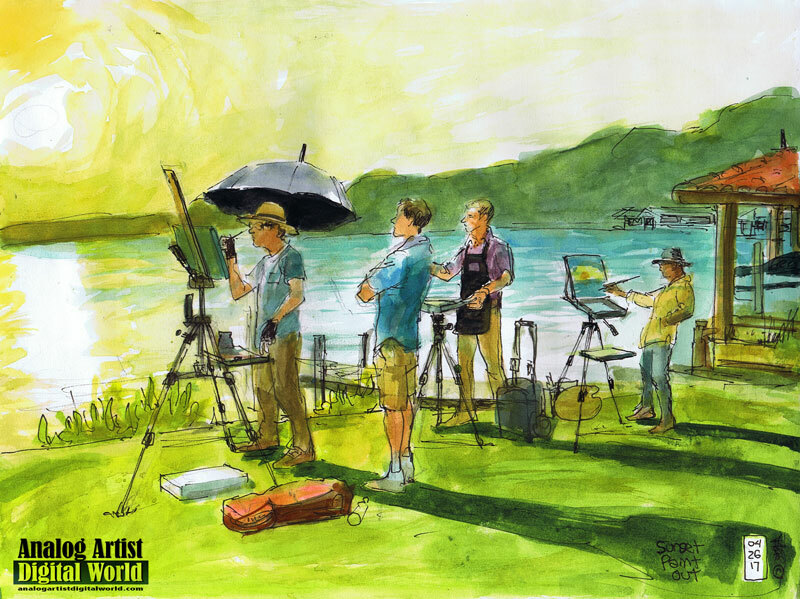 Vladislav is the one watercolor artist among the 25 or so plein air painters. His loose watercolors have a limited palette and have a full value range with little use of line. I vastly a mid every piece of his that I saw in the Polasek wet gallery. Some artists who finished their paintings had frames that they used to store The is still wet panels. I had never thought about the notion that a frame is a good way to store and transport a wet painting. many paintings were sold right off the easels. A patron could walk away with a still that night. The me were free drink samples available. I tried a coconut rum mixed with pineapple juice. H was delicious, but the shot glass sized plastic cup left me wanting more. Hal Stringer offered me two drink tickets and I cashed them in at the end of the evening for two red wines. This paint out week is a fun event I really should be a part of next year as they celebrate their 10th anniversary.